In September of 1931 in a small farmhouse on the Isle of Man, the Irving family began hearing odd sounds coming from the attic of the home. Initially, they sounded like a wild animal moving around, but after a time the ‘animal’ began making sounds reportedly similar to those of a baby learning how to speak. It then began to mimic words spoken by the Irvings, much in the fashion of a parrot. Within months, the creature, which the family apparently hadn’t yet seen directly, began speaking increasingly fluent English, relating to the Irvings that it had been born in New Delhi, India on June 7, 1852. No explanation was given as to how the animal got to Britain. Other paranormal activity began happening around the house, such as objects flying across the room inexplicably. The voice of the creature began spying on the neighbors and reporting back to the Irvings, and shortly after the creature revealed itself to be a mongoose, or something similar and even allowed itself to be petted by Margaret Irving. Other locals began hearing odd sounds that they attributed to the Irving’s mongoose, and the animal reportedly began ranging around the town, always reporting the local comings and goings of the day back to the Irving’s. The press became infatuated with the story of the talking mongoose, and soon Gef, which it claimed to be its name, became a celebrity in the British media. An investigation done by paranormalist Harry Price in 1935 revealed little. Hairs thought to be from Gef turned out to belong to the family dog, and the few photographs Price was able to take were of poor quality, and one of them appeared to show a cat. The Irvings left the farmhouse, and Gef, in 1937. Sometime after, the new owner shot a large mongoose-like animal which may have been the creature. Mongooses normally do not speak, nor was Gef definitively determined to have been one. One theory is that Gef was a poltergeist that had the ability to appear as a mongoose, or trick the family into believing that he was one. He might have been some type of bizarre mongoose-like cryptid, or he may even have been a hoax. 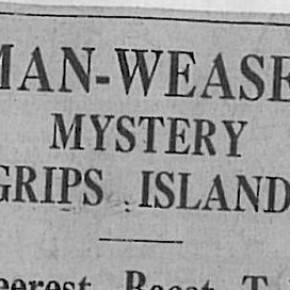 In any case, the tale of Gef the Talking Mongoose remains an unusual story that today is obscure, but in the 1930’s had delighted and gripped the British public.